Four-color process printed on Side 1 of 12pt C1S Semi-Gloss stock. Coated with Aqueous Satin. H3 business card slits on left pocket. 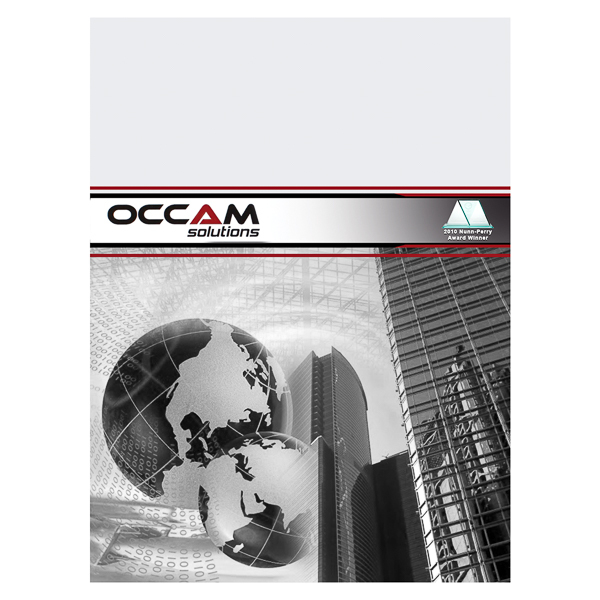 The triangle "A" hints at the stability of Occam Solutions' infrastructure, mission support technology, and consulting. This reliability is critical for the brand's clients—especially the U.S. military and security departments. Two globes are rotated to show both sides of the world, implying the reach of Occam's services. On the back cover, an open padlock and high-tech grid suggest ultra-strong security. Side 1 printed with four-color process. Side 2 printed with 1 PMS color using heavy coverage. 14pt C2S Semi-Gloss stock coated with Aqueous Matte and Spot UV. D1 CD/DVD slit on left pocket, with H4 business card slits on right pocket. 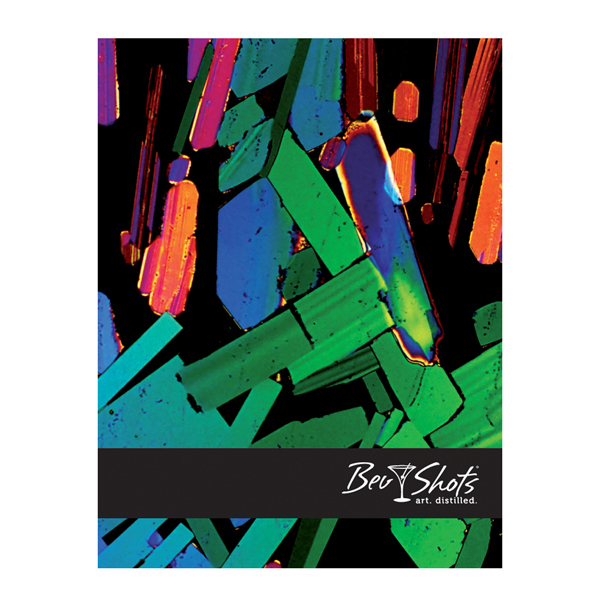 BevShots' colorful abstract shapes are more than artistic paint splatters; the background is actually a microscopic photo of crystalized liquor. Black space between the particles and a matching black band circling the folder create a high-end look. A simple black and blue interior mirrors the mostly blue alcohol particles on the back cover. A horizontal left pocket offers a place to hold promotional CDs/DVDs. The vertical right pocket provides extra information about BevShots, with a border of thin abstract patterns borrowed from the cover photo to tie the whole design together. Four-color process printed on both sides. 12pt C2S Kromekote stock (currently unavailable) coated with Aqueous Gloss. H1 business card slits on left pocket. Pride Global's design demands attention with its combination of bright primary colors, bold rectangular shapes, and vivid photography. These elements work together on the front cover to emphasize the company's four core values: client focus, experience, team work, and results. Slender lines connect the text for a cohesive look. Every photo has a unique shape and size, adding visual emphasis to each core value, while the bright rectangles create a simple, modern pop of color. Inside, a green background and blue pockets provide a bold look without overwhelming the eye. 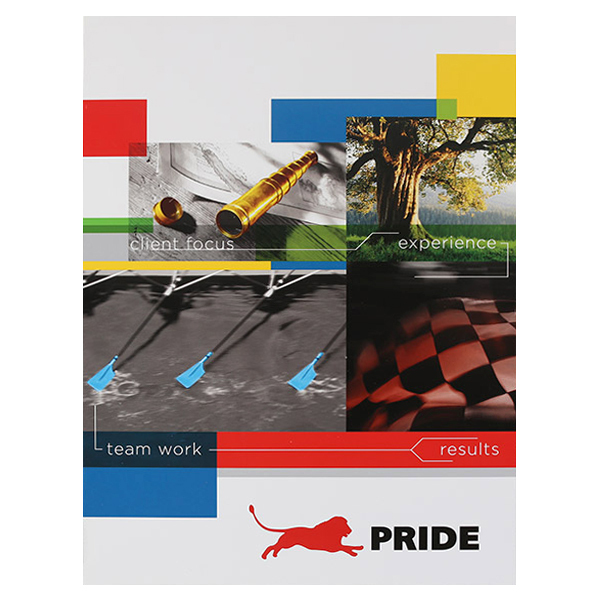 The repeated lion logo emphasizes Pride Global's pride in all its brands, which are showcased on the vertical right pocket. Side 1 printed with four-color process. Side 2 printed with 1 PMS color. 14pt C1S Semi-Gloss stock coated with Aqueous Gloss. H4 business card slits on left pocket. 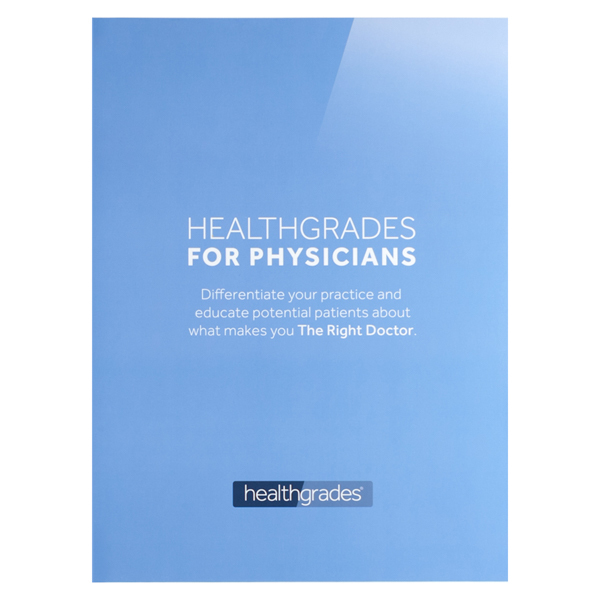 Cool white-on-blue panels mimic the slanted line in the two-tone Healthgrades logo. The site, which lets patients find doctors based on skill or location, includes a short paragraph encouraging doctors to create profiles. A colorized interior photo shows a patient using the online network, pairing visual encouragement with the cover's written invitation for a stronger appeal. The back cover offers more brand information to help seal the deal. Have the best of both worlds with vertical and horizontal pockets. Each pocket holds 8 1/2" x 11" print media, yet they do so in different ways. A traditional 4" left pocket features a v-split for extra flexibility. On the right, a 12" tall vertical pocket offers greater coverage for your documents and gives your clients an unexpected surprise when they open the cover to see its one-of-a-kind design. The right pocket can also be used as an info panel to introduce potential clients to your brand. Dimension Open: 18" x 12"